to send future issues of the newsletter to you or your organization. Canadian Philately — An Outline: A Summary of Collecting Areas and Interests of British North America Collectors, by John Burnett, Gray Scrimgeour, and Victor Willson. bnaps_bookletThis excellent overview of BNA philately is made available courtesy of the British North America Philatelic Society Ltd. and its authors. Thanks to BC Phil Treasurer Derren Carman for designing and printing the new vouchers. 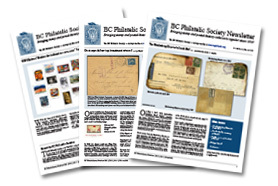 Regional Philatelic Directory, a listing of upcoming philatelic events in Greater Vancouver, Vancouver Island, and the Northwestern U.S.
A list of the library holdings of the BC Philatelic Society, in PDF format. “BC Phil Exhibitions”: Data about stamp shows in Vancouver since 1925, compiled by BC Phil Archivist Eric Ranger. It seems that funding has presented problems to show organizers in the past, and stamp shows have been an on-again off-again activity. An article, "What to do when you inherit stamps," by Bob Ingraham, Immediate Past President of the BC Philatelic Society. If a relative or friend has bequeathed a stamp collection to you, or if you found one in a dumpster, you probably want to know what it’s worth and what to do with it.